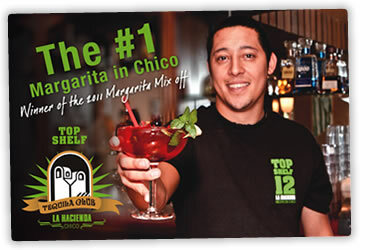 Stay in touch with La Hacienda Restaurant-A Chico Tradition since 1948! When you join our email list you will become a part of an exclusive club with special perks! Each month expect an email with a great deal and updates on everything that is happening at the restaurant. Because we value our customers greatly we will never sell or divulge your email address or personal information. Sip your way through 12 of our different Top Shelf Tequilas and get your picture in our hall of fame as well as a Top Shelf 12 Tequila Club member T-Shirt! Many tequila distilleries have evolved this spirit into one of the finest drinks around. Our Tequila Club gives you the opportunity to try unique tequila from creative producers. With so many different tequilas, each with its unique personality- why not give you a chance to try them all! 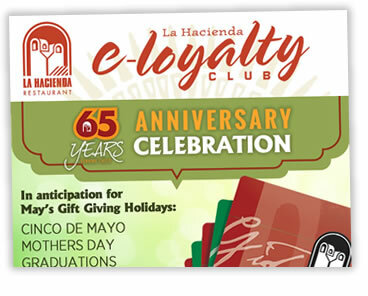 To say thank you in a more concrete way 10 years ago we established our Loyalty Club because we are well aware that it is repeat customers that are responsible for the longevity of the restaurant. 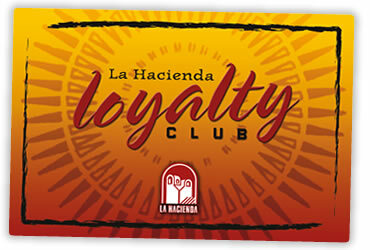 By becoming a member you will be eligible for many tasty rewards!